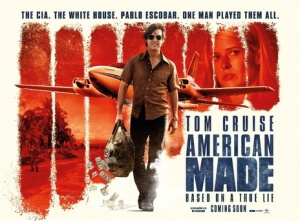 Barry Seal, the pilot turned drug smuggler and government informant caught in the middle of the Iran-Contra scandal of the mid-80s, would have dug the hell out of American Made. It is, according to sources who knew Seal rather well, just as adrenaline-fuelled, thrill-seeking and egregiously driven by its own personality as the man himself, and hiring none other than Tom Cruise to play him on-screen – despite looking almost nothing like him, though when has that ever stopped Hollywood before? – just makes the deal even sweeter, because if there’s any real-life figure that Cruise was meant to play, at least in terms of charisma and charm alone, it’s this guy. It also elevates the movie to being something more than just a standard Tom Cruise vehicle; it’s also a highly stylised look at a fascinatingly absurd embarrassment for the Reagan White House, which also happens to have tons of personality to spare. The film takes some liberties in tying together Seal’s many exploits, from his days as a lowly smuggler during his day job as a TSA pilot, to being hired by a shady CIA operative (Domhnall Gleeson) to fly over Communist-overrun parts of South America and take pictures, to then working as a drug smuggler and money launderer for the Medellín Cartel (among them the nefarious Pablo Escobar), to transporting weapons for the Contra militia direct from the CIA, and then working as an informant for the DEA in a mission that saw him report directly to the White House. It’s all insane, and yet it’s all what (mostly) actually happened in real life. That’s part of what makes American Made so devilishly entertaining, knowing that no matter how unbelievable the situation got, it was all just part of the real story. Director Doug Liman – whose previous film with Cruise, Edge of Tomorrow (or Live Die Repeat or whatever the hell they’re calling it now), was also a pretty fun ride that made extra good use out of its lead star – mixes a docudrama feel with a darkly-comic but no less lighter tone, which gives it a humorously tongue-in-cheek awareness that as the situation gets more and more dire, it also becomes more and more ridiculous as it gets even further out of hand. Even more baffling is how it was all pretty much backed by the US government, for utterly selfish and self-aggrandising purposes; their mistake just happened to be hiring a pretty corrupt guy to do their dirty work for them, because someone like Seal would of course look for other money-making ventures to further expand his own operations, namely becoming a drug runner for Pablo Escobar. The real-life incident was a major embarrassment for the Reagan administration, and even if half of what happened was actually true, then it serves them right for being cocky and arrogant enough to plant this seed of corruption in the first place. The other part of American Made’s enjoyment factor is undeniably Cruise himself. After focusing a bit too much on exclusively action fare over the last few years, from sequels to Mission: Impossible and Jack Reacher to headlining the failed cinematic universe kick-starter that was The Mummy, it’s nice to see Cruise get back to more character-focused material, with which he can actually showcase that he’s not just an actor who can pull off a few death-defying stunts on camera, but can genuinely turn in a compelling performance every now and then. Here, Cruise uses whatever charm he can muster from thin air to carry this movie on his broad shoulders, and spends a lot of the movie with that unmistakable Cruise smirk and white-toothed smile that he somehow makes work for the larger than life character he is playing. He’s a lot of fun to watch here, as he waltzes through episode after episode of insane encounters and personal relationships with that kind of swagger and charisma that only Cruise could pull off in his sleep. There are a few noticeable “Cruise-isms” such as his on-screen wife (Sarah Wright) being considerably and noticeably younger than the 55-year-old Cruise – there is a roughly twenty-year age gap in between actors – and there are one or two action sequences that seem custom made for the star to perform in, but after a short period of coasting in a lot of action movies, some of them not very good, this is a refreshing reminder of why Tom Cruise is, indeed, a real movie star. It’s a movie that will no doubt leave you entertained and never bored, even when there are parts that threaten to drag even at a running time of just under two hours, and if anything this fictional representation of the real Barry Seal and his many illegal exploits will probably get you to find out a bit more about this crazy period in the 1980s where everyone was seriously out for themselves, and the US government got so full of itself that they just hired this pretty corrupt pilot to really get their fingerprints dirty. The movie is chaotic, anarchic, and downright insane at times, but then again so was this real-life story, so it’s pretty much a perfect way to represent this dangerous, ego-driven and utterly mad world. American Made is a largely entertaining movie that explores a very unbelievable situation and larger-than-life character with a stylish and personality-fuelled edge to it, with Tom Cruise giving one of his most character-focused performances in years.